It won't actually be floating over your house... we think. THE GOVERNMENT HAS revealed more details about Ireland’s new postcode system, due to be rolled out across the country next year. Known as Eircode, it will be used to locate every individual address in the State. 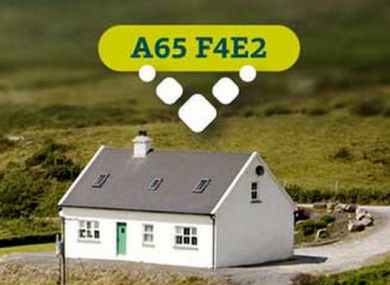 Eircode.ie details that “every address in Ireland will receive its unique Eircode in Spring 2015″. Each code will consist of seven digits – a three-digit ‘routing key’, and 4-digit ‘unique identified. The routing key is not directly liked to any individual towns or counties, and has been liked to a prefix number on landline phones. The unique identifier is for an individual address. The code’s design has a “flexible structure with plenty of spare capacity”, EirCode.ie details, and so is future-proofed. Businesses will be encouraged to adopt the code later this year. Email “Here's what Ireland's new system of postcodes will look like”. Feedback on “Here's what Ireland's new system of postcodes will look like”.